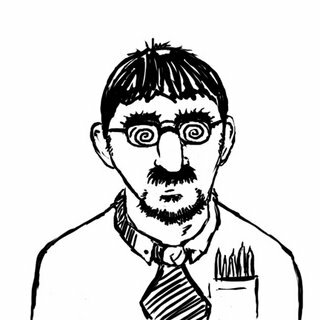 of frustration are generally overcome with time and practice. I had always wanted to do a 'relief' type illustration where the image protrudes from the picture plane as well as wanting to work on claybord. While going through an art history book I have I ran across a rhino vessel from the late Eastern Zhou Period. I figured since I was on a bit of a break I would give it a try and start to get a feel for both. 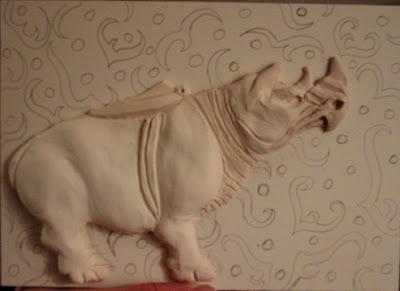 I started by drawing out an outline of the rhino to use for a separate illustration. The claybord didn't hold the graphite like I thought it would so I figured I would use the outline as my template. 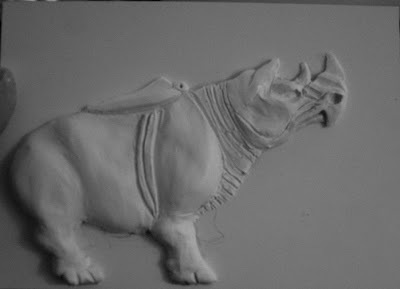 I had purchased a small block of Super Sculpy for $1.77 and started to mold it to the panel. place. Once I started adding in the body it held in place a lot better. form, but a lot of smoothing I just used my finger (Sculpy is also easy to smooth without worrying so much about gobbing up). I do like the contrast of the flat panel with the white form. There is a great lesson here. Thanks for posting it. I am impressed with the rhino. it's fun to see your thinking process, professor. 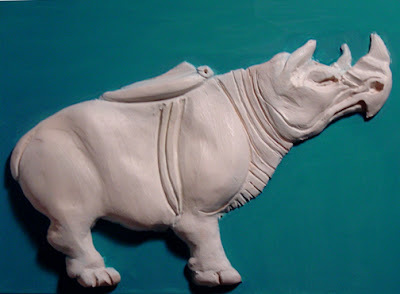 i know of the turqouise ceramic rhino artifact you speak of. Wow! Great work! Really love reading the process.